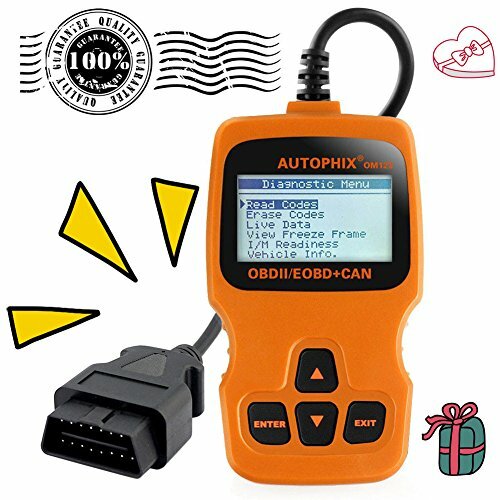 Hand-held OBD2 tool-OM123 make it a easy way to saves time and money on repairs- find out what's wrong prior to repairing and verify a repair , OM123 offers peace of mind for anyone who has ever worried about car maintenance. MULTILINGUAL MENU OPTIONS: Multilingual menu options and code definitions-English, Spanish, French, German and more. You can be in "Setting-language menu" click on the "confirm" to choose the required language switching language types. 1.Turns off ignition and check engine light.Locate the vehicle's 16pin Data Link Connector(DLC). 2.Plug the scan tool cable connector into DLC.Turn the ignition on. 3.Press ENTER to Main Menu.Use the UP/DOWN scroll button to select Diagnostics from the menu. 4.Clear codes and resets monitors. Reads live data stream. Views freeze frame data. I/M monitor readiness test. Retrieves vehicle information(VIN, CIN and CVN). a) Always perform automotive testing in a safe environment. b) Do not attempt to operate or observe the tool while driving a vechicle. Operating or observe the tool will cause driver distraction and could cause a fatal accident. c) Operate the vehicle in a well ventilated work area: Exhaust gases are Poisonous. d) Put the transmission in PARK (for automatic transmission) or NEUTRAL(for manual transmission) and make sure the parking brake is engaged.